As I stated in my Impressions piece, which you can check out here, I’ve been a fan of Wadjet Eye Games for quite a while now. Their level of wit and charm is incomparable to any other game studio that I’ve seen using the Adventure Game Studio software. So when I was offered the chance to try out their latest game, Unavowed, I immediately jumped at the chance. How does this game stack up? Well for starters, the clever writing and humor is just as strong as ever. In my opinion, Unavowed is the most well written game that they’ve ever come out with. The basic plot is that you’ve been possessed by a demon, and therefore must join the Unavowed, a group of people with mythical powers that works sort of like a supernatural police force. Your job is to undo all the wrongs that your demon committed, as well as to hunt him down so that he can never do anyone harm again. It’s a really simple plot that’s built upon with all of the choices you get to make, but we’ll get to that later. The story starts off simple, but grows and twists to form a very satisfying story at the end. The character writing, as well, was phenomenal. You grow attached to them not because the game wants you to, but because they’re so well written and likable. They all have their own thoughts, emotions, and personality. My two favorite companions that I always brought with me on my first playthrough were the spirit guide and the fire mage. I won’t spoil why, but their stories hit me on a personal level that not a lot of games manage to do. I genuinely love the world and characters that Wadjet Eye have managed to create here, even the NPC’s which would be ignored in most games. It’s really something special. Normally I would talk about the art in the second paragraph, but I decided to save it for this one not because it’s bad, but because I felt the story needed some extra attention. Either way the art of this game matches up with a lot of what the developers are used too, with a bit more polish. All of the characters have immediately striking and iconic designs that tell who they are as a character. For instance, Eli is a fire mage from the 1920’s, so he dresses like a detective from that era, complete with his own trilby hat and trench-coat. He’s almost always smiling in a a gentle and calming way, letting you know his kind nature. It’s a small detail that’s easily noticeable and really welcome in my book. 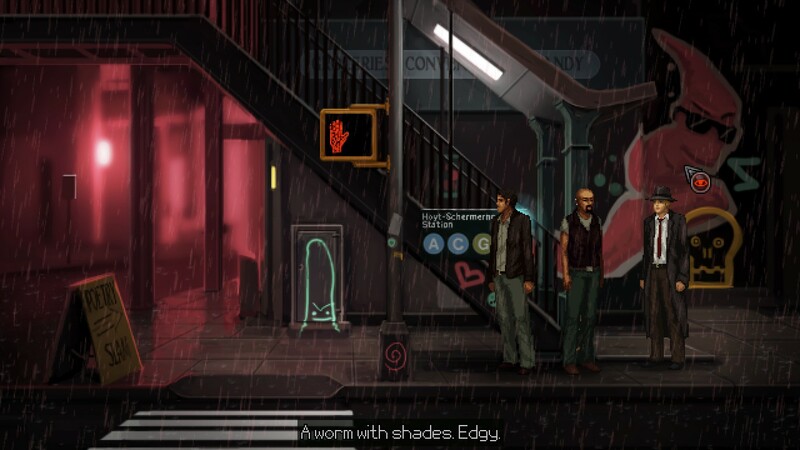 The atmosphere, as well, is often dark and dreary due to the old Noir films that the game likes to emulate. I can’t really say much more on the art, it’s just wonderful and instantly recognizable. It gets an A+ from me! Speaking of not really being able to go into a lot of detail, we have the sound design. I don’t really have much to say other than it works. All the sounds are crisp and clear, and the voice acting is top notch. There isn’t really too much music, but the ambient noises fill that void nicely. It all adds to the ambiance and is really well done. The only issue I have is that sometimes the audio sounds a bit weird for some characters, but that’s easily forgivable. 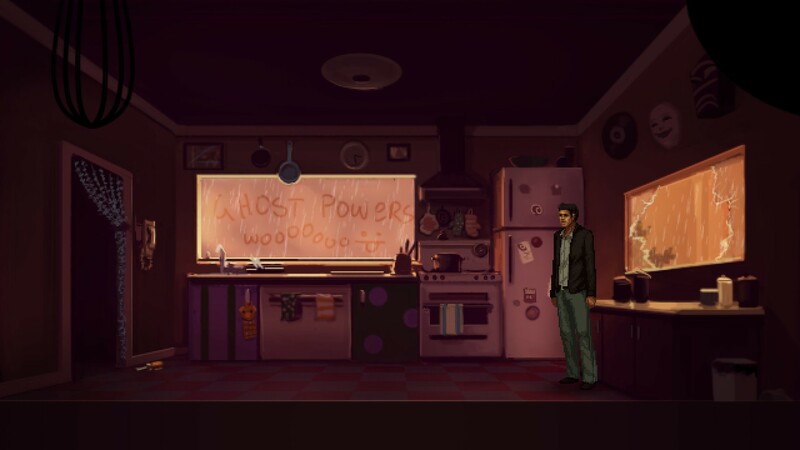 As a Point-and-Click game there isn’t really much to explain. You walk around gathering information and items in order to solve puzzles and advance. The puzzles aren’t terribly hard or obtuse, minus a few glaring examples (*cough* Dragons *cough*), so from a difficulty perspective the game isn’t necessarily hard. The fun, for me, comes in the twist. See in this game, what you do affects how people think of you and which of the four endings you’ll get. You really can play this character how you want, and it’ll affect how the last mission plays out, as well as all the dialogue leading up to it. It actually feels nice to go back and replay it with a different mindset. You can pretend you’re almost an entirely new person. Not to mention you can also choose between three professions at the beginning of the game that outwardly affects who you know and what happens to get you to where you are before the possession. All in all Unavowed was a really fun experience that I’m planning on going through multiple times just to see how things play out. I’m currently on my second playthough and have a total of 9 hours in the game, which is really good for the $14.99 price tag. I would definitely recommend that anyone and everyone picks this game up. I had a blast and the story/character interactions genuinely brought tears to my eyes on a number of occasions, and made me laugh even more. It’s definitely a must play!